When it’s hot, the pool is a great way to chill out. But even pool time can get boring if you don’t have the right kind of games to add to it. 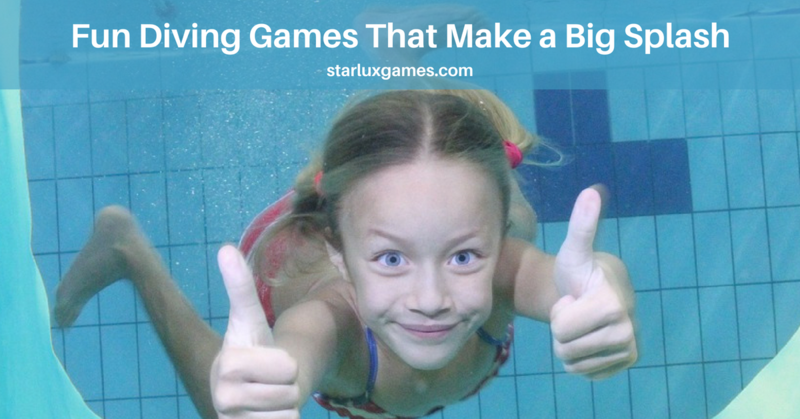 If you want a great recipe for a really fun summer, take a big pool of water, add a good heaping of kids, a pinch of summer sunshine and mix it all up with a sprinkle of the best diving games for kids to play in the pool. Here’s a top ten list of current favorites that not only encourage fun, but also strengthen swimming and diving skills. Your little mermaids and scurvy pirates will love searching for sunken treasure with this fun and easy-to-use diving game. Simply sink the treasure chest and then dive on in and try to collect as many coins as you can. The set comes complete with a brightly colored treasure chest and 39 coins. Recommended for ages 5 and up, it’s the perfect way to strengthen their swimming while they grow their imagination. You can find the “Splash Bombs Prime Time Toys Diving Masters Treasure Chest Pool Diving Game” on amazon. This is a quick and inexpensive diving game for kids that will keep them entertained for hours. Grab a few empty clear 2-liter bottles or water bottles with light-colored caps and fill them up to the brim with pool water and close the caps. Then, line up the players on the side of the pool with their backs to the pool. Throw the bottles in the water and let them settle. The players then turn around and begin the search as the clear bottles blend in with the bottom of the pool. You can play with one bottle and have an ultimate winner or with numerous bottles and let everyone find one. Your little budding marine biologists will love this game that comes with ten plastic eggs and ten baby turtle-sinkers that fit inside. Each baby turtle features bright colors and numbers. Toss them into the pool and then gather them all up to “hatch” a number of swimming and sorting games. All game pieces are fade-resistant to stand up to sun and chlorine exposure and the eggs parts are hinged so that matching pieces don’t get lost. The set includes five yellow turtles, five orange turtles, the ten plastic eggs, plus activity and game ideas. This game can be found on amazon. Gather a collection of fun item pairs that will all sink to the bottom of a pool. For example two dive rings, two quarters, two plastic animals, two toy cars, two rocks – you get the idea. Then, toss them in all parts of the pool and let them sink. Divide the players into two teams and give them a scavenger hunt list in a sealed plastic baggie to keep it dry. At the word “go,” each team must dive and search to collect one of each item. The first team to collect everything on the list is the winner. Just because the sun goes down, doesn’t mean the fun has to. 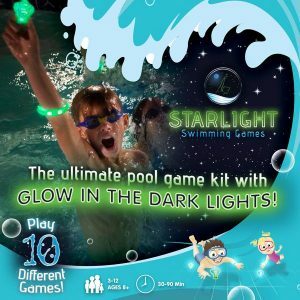 Play your favorite swimming pool dive games after nightfall with this glow-in-the-dark swimming kit. You can play ten different games with the enclosed waterproof glowing games pieces and game ideas. Classic swim games like Treasure Hunters and Human Whirlpool are even more fun after dark. The kit includes six glow bracelets, four dive diamonds, six border lights, two glowing flowers, batteries and a guidebook with game instructions. Simply twist each light on and toss into the water for an amazing swim and dive party. 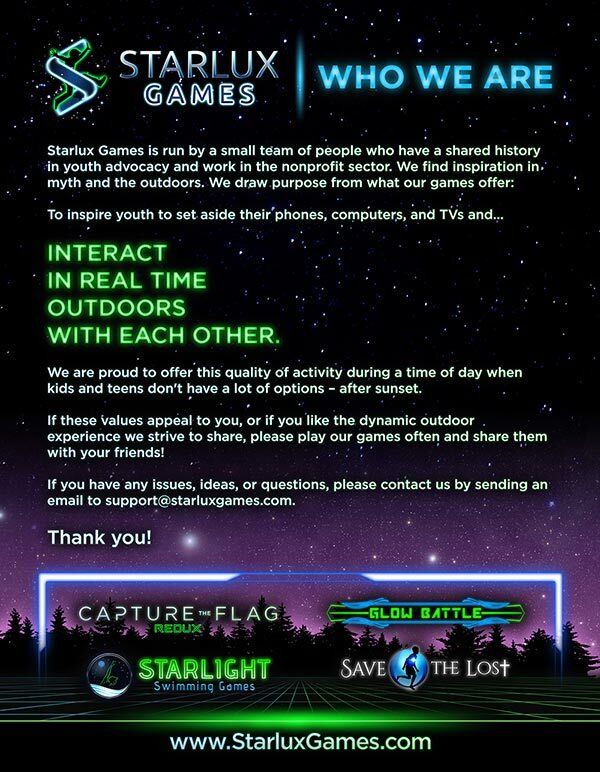 Available for purchase here at Starlux Games. When you want to do some seriously fun dive training, this kit has it all. This ultimate diving pool toy set comes with a total of 14 pieces, including four diving pool rings, four shark toys, three tropical fish toys and three sinking Fun Balls. Just throw them into the pool, and these colorful toys instantly sink or stand on the bottom making them easy for little hands to pick up. All you need to add is water. You can purchase this game on amazon. If you’re looking for a last-minute, easy-to-organize diving game for kids, this game is a sure bet. Simply gather different colored poker chips and scatter them throughout the bottom of the pool. Then, shout “go” and let the players race to dive and retrieve them. You can designate a different point value for each color poker chip and add up each player’s score at the end. If you want to make it more challenging, you can also throw less of the higher point chips in the deeper sections. Put your diving skills to the test with these colorful and innovative collapsible water rings. They are 31” in diameter allowing you to dive through them while their adjustable air chambers let you change how deep you want to go, making it versatile for all swimming levels. Plus, their vivid sea creature motif adds a little fun to the pool whether you use them for swimming lessons or recreation. You can purchase Water Sports Swim Thru Rings on amazon. When it comes to adorable diving games for kids to play in the pool, this one takes the cake. You don’t have to be British to enjoy a good, old-fashioned tea party…under the water. Grab your goggles and dive to the bottom of the pool with a few friends. Sit cross-legged on the bottom of the pool, while you pretend to attend a fancy tea party. Greet your guests, serve them tea, and hold out your pinky while you pretend to drink it. Your kids will have so much fun helping Mr. Ray pick up Dory and her friends with this game. Throw the baby Nemo, Dory, Pearl, Sheldon and Kathy toys in the water and then dive to scoop them up with the Mr. Ray net. All of the characters float at different depths of the pool to further add fun and challenge to the game. Each pool toy set includes one Mr. Ray net and five fun characters. You can purchase this game on amazon. So, whatever dive game you choose this season, just keep swimming!